Esplora la regione vinicola dell'Alsazia in un tour privato da Colmar che ti porta in quattro cantine. Viaggia lungo la strada del vino dell'Alsazia e lungo le pittoresche strade secondarie, ammirando paesaggi meravigliosi e villaggi da fiaba lungo la strada. Goditi degustazioni di diverse varietà di vino mentre impari sulla vinificazione in questa regione della Francia. Pieter Smits is amazing. He took my husband and I, my sister and her husband on an adventure to remember. The tour was the highlight of our trip. We toured several wineries and did extensive tasting. He also took us to two wonderful xmas markets. He is knowledgeable and generous with his time. If you are visiting Alsace I highly recommend scheduling this day tour. You will walk away with a greater knowledge of the region's wine production and history and you will gain a greater appreciation of the region as a whole. What a great tour! This was a private tour to four wineries, and the tastings were plentiful. 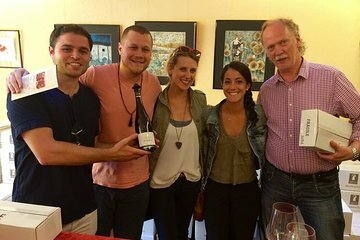 We were warmly greeted at each winery and in one case actually sat with one of the owners during our tasting. Our wonderful guide, Pieter, is so knowledgeable about both the area and the wines, and presented us with a very enjoyable and fascinating day. This day was the highlight of my vacation! I highly recommend signing up for a tour with Pieter.